I hope at least one person has missed me on the blogosphere. I kind of like to think that some secret skeptical follower has been checking in occasionally and thinking, “Ha! He’s teetering out and giving up on his inane and futile experiment.” I guess that, when I’m confident of my purpose, I thrive as much on skepticism and challenges as I do on friendly support—even if just in my mental dialogues. If that imaginary skeptic had access to my Chinese-viewing log between June 20 and July 4, his doubts would have redoubled. I heard absolutely no Mandarin during those 15 days. Actually, that is similar to what happened last November-December, and the reason was the same, with an added element. Once again, I was one of the main persons responsible for organizing a large conference of Supreme Audit Institutions (SAI), this time in the beautiful city of Quito, Ecuador. Additionally, however, the big event occurred the week before my Law exams, one of which I particularly dreaded. In any case, since July 5, I’ve been averaging 40 minutes of daily viewing, and I expect to increase that time somewhat during the next few vacation weeks. For anybody who actually missed reading my posts, I’m truly sorry that, for the first time ever, I did not post for four straight weeks. I hope it won’t happen again. At least—in case you’re wondering—the SAI event was successful and I got through my first semester back in Law school with good grades, despite a few scares. In the past few days, I’ve mostly been watching Qiao Hu episodes. This is certainly not the most exciting viewing, but it holds two distinct advantages: I can understand a good deal with no subtitles, and, consequently, it is relatively easy to review and decipher vocabulary. I also began with a brand-new viewing source: television news, streamed online. I understand next to nothing! It’s almost like starting my experiment all over again, in that I’m hoping the incomprehensible sounds will gradually coalesce into intelligible words and sentences. It’s different, of course, in that the phonemes and rhythm of the languages are already familiar, and I do understand a word here and there. However, if my current comprehension when watching dialogues in a movie or drama is 15%, as I have estimated, when watching the news it’s probably closer to 2%. I have just begun exploring news sources, but can comment on the two I have found thus far. CCTV is an official government source, and thus has the advantage of being in perfectly standard Mandarin (I presume), and the disadvantage of being boring to an extreme. Phoenix TV, out of Hong Kong (if I’m not mistaken), is of much better quality, but I’ve had occasional problems streaming. I look forward to watching more and more Mandarin for the rest of this month, and posting a report at least once every two weeks. Thanks for reading! In the past year and five months, I have watched 360 hours of authentic Chinese videos, including a few dozen hours of listening to songs in Mandarin. Thus, I have concluded 30% of my experiment’s 1,200 hours. Each time I complete an additional 10% of the experiment, I test my comprehension. I conducted the same test today as I did at the 20% mark (which I also repeated at 26% completion). My results continue to be encouraging, though quite modest. I currently assess my standard Mandarin comprehension at 15%. I used the same Singaporean soap opera, Two Cities. I watch this show and this genre exclusively when taking these tests, so that I don’t get used to the specific dialogue or voices. I go months at a time without watching a single minute of any soap opera. As before, I watched the first 15 minutes of a brand-new episode of Two Cities and jotted down the words I thought I understood. I then went through the 15 minutes a second time to get a more precise count, excluding words I got wrong and adding words that I understood the first time but did not have time to write. This was the exact procedure adopted in my last two tests. I should stress, as usual, that I included all word occurrences. If wo (I) repeated twice in a single sentence containing about 10 words, I scored 20% for that sentence, even if I understood nothing else. I did one thing differently this time around. Instead of making a rough guess of the total number of words in each segment by glancing at the number of characters in the subtitles and going by my “feeling,” I actually counted the number of characters with a fair amount of precision and divided that number by 1.5. A bit of research online had turned up the ratio of approximately 1.7 characters per word. However, I feel 1.5 is a better number to use for two reasons. First, and most importantly, I think the ratio is likely to be lower in this type of dialogue, since so many word occurrences are simple single-character words like wo (I), ni (you), shi (to be), bu (not), mei (not), and so forth. Put another way, I’m assuming that, like English, oral Mandarin has a higher preponderance of monosyllabic words than written Mandarin, which is likely to include more technical and literary terms. The second reason is simply that I believe 1.5 is closer to what I was estimating in previous tests, making my current result more comparable to previous scores. (If I had used 1.7, my estimated comprehension would be 17% rather than 15%). I am pleased with my result of 15%, since it continues to suggest accelerating comprehension, as the above graph illustrates. I would refer readers to my more detailed discussion of results and possible projections in my 20%-assessment post. 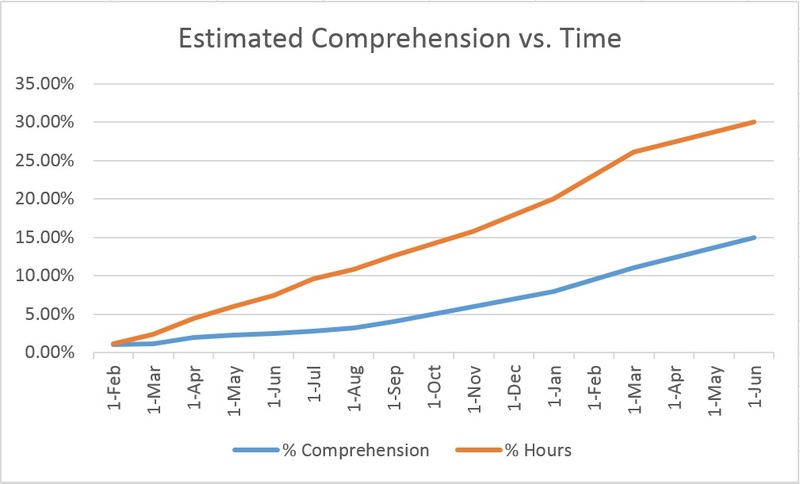 Extrapolating my rate of learning in these first 360 hours to the full 1,200 hours of my experiment—a projection of tenuous value at best—would take me to 50% comprehension by completion of my experiment, which would probably not be quite enough to consider myself at an intermediate level of comprehension, but would be enough to constitute a strong foundation to build on with other language acquisition methods. I would estimate that about 15 words accounted for 90% of the word occurrences that I understood in this soap opera segment. I knew all of these 15 words in January, when I had completed 240 hours (20% of the experiment). Nonetheless, my estimated comprehension jumped from 8% to 15% in this period. I do believe my improved score reflects real progress, and was not a fluke or the result of poor test design. Based on that assumption, what this improved score reveals is a better-tuned ear and a greater ability to hear and decipher the simple words that I learned a long time ago, rather than a larger vocabulary. Undoubtedly, my vocabulary has increased in the past few months, but the test results do not reflect that nearly as much as simple auricular training and adaptation. In fact, a quick glance at my test notes reveals only four words that I may not have known at the 20% mark: jia (home), he (drink), zai (to be [location]), and jiao (to be called, referring to names). Most or all other words are “old vocabulary” from the first year of my experiment, and the majority very simple terms deciphered in the first few months. Perhaps a more important—if less precise and objective—observation is that I believe my comprehension of the overall meaning of what I watch is a bit better than it was a few months ago at 240 hours of listening. Most of my comprehension is still based on visual cues, but the contribution that actually understanding Mandarin words and expressions provides has increased, very slowly but surely. It is a rather hackneyed observation that the pace of modern life for those who want to “get ahead” is frenetic. You´d better work and study hard, because there is a determined Chinese kid somewhere anxious to take your place. For the past 24 years, Chinese GDP has grown at annual rates between 6% and 14%, and will soon overtake the US as the world’s largest economy. Recent headline news tells us that the Chinese are currently building islands at lightning speed in the South China Sea, threatening to make competing territorial water claims a rather moot point. Nations interested in pursuing competing interests better not blink. Everybody needs to keep up with the Chinese. Well, more accurately, I’m trying to attain some image of the good life—a collage, perhaps. Raising my daughter, intense work at my public service job, including extensive international travel, evening Law classes, guidance to the company I founded, managing my farm and tree plantations on weekends. And, of course, learning Chinese. It’s been hard to squeeze in the Chinese of late. My word list has taken on much greater relative importance, for three reasons. A couple of months ago, before my Law classes began and things were much less hectic, I decided I would start adding two words per day, instead of just one. I have fallen way behind. Second, as the words pile up and the database keeps growing, there is that much more to review. Lastly, I’m devoting much less time per day overall, so keeping up with the Chinese word list requires devoting a much higher proportion of my total time than before. This past week, I watched Dragon once again, since so many words from it popped up for review in my database. In addition, I listened to the Mandarin songs I have memorized about three times while driving—Nan Zi Han, Boonie Bears intro song, and, from Little Dragon Tales, Ni Wa Wa, Zhao Peng You, and Liang zhi liao hu. I’m enjoying my experiment as much as before, but time constraints mean I’m struggling to keep up with the Chinese. My schedule becomes more relaxed, and I have more time. Like just about every blogger, I would love to have people anxious and drooling expectantly for my next post, and ever-increasing hordes of readers flocking to these pages. On the contrary, to date, I’ve found that if I don’t actively mention my blog on forums and message boards, readership will not increase. There is no momentum. Nevertheless, I’m very happy to share my experiences with my few regular, faithful readers, and with the many more who chance upon my blog each week. Cheers! I had hoped to make my two-day trip from Cape Town back to Brasilia (via Dubai) an unprecedented Mandarin movie marathon. Then, I got news that I have a Criminal Law exam next week. I did watch a couple of movies, but I split my time with my Law book. And when a flight delay meant we had to spent 24 hours in Dubai, I obviously made seeing the city my top priority. Should I have made my Mandarin studies a higher priority? How important is language acquisition to me? I have been reflecting on this in light of advances in machine translation. I picked up an Economist magazine at the Cape Town airport and read the cover article on Artificial Intelligence. It discusses how deep thought and big data are, among other things, bringing us much closer to the point where machine translation will match the quality of human translation. For years, people (especially translators) have told me this will never happen, but I’m quite sure it will. One of the more interesting and well-made points of the article is that white-collar jobs will be increasingly replaced by computers. The translation and interpreting professions have limited lifespans. You might need a few high-level professionals to tweak important documents and of course guide improvements in software, at least in the foreseeable future. Nonetheless, I would not recommend my daughter consider translation a primary professional option. So how useful is my Mandarin-learning quest? Of course, I am doing it for pleasure, for the challenge itself and the benefits to my brain, and as a pedagogical experiment. However, underlying my enjoyment and motivation is the assumption that I am acquiring a very useful skill. If learning more about forestry and government auditing work–two activities that have a significant financial impact for me–would be vastly more useful for my future, why should I invest so much time in acquiring and improving Mandarin and other languages? I won’t be surprised if within five or ten years Skype allows me to communicate seamlessly with people in all major languages (they are working hard on this), but I doubt computers will replace human judgment on audit reports, international cooperation, or managing labor to care for my tree plantation. But I will keep an eye on technological advances in the field of translation and continue reflecting on the utility of language acquisition. 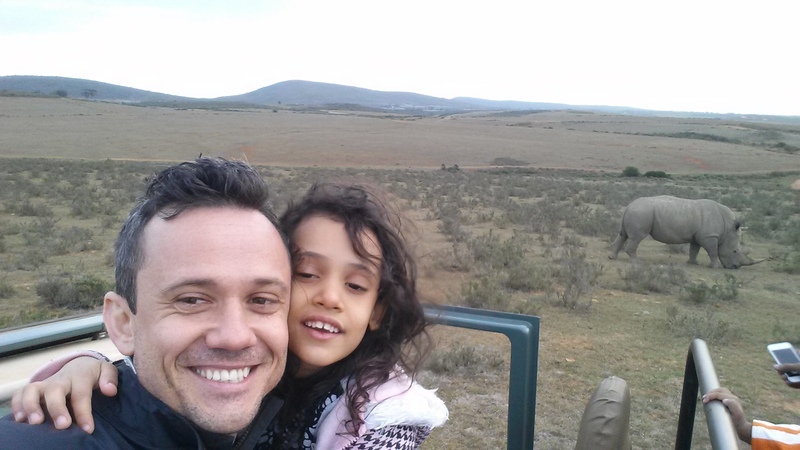 I spent the past week in South Africa with my wife and daughter, much more concerned about cheetah sightings than Mandarin viewing. The isolated Mandarin-experiment highlight of my week was during the wee hours of my Emirates flight from Dubai to Cape Town. After finishing the first draft of a paper due the next day for my Property Law class, I was too caffeinated to go right to sleep. So I browsed the extensive in-flight film collection, and to my delight, there was a whole section of Mandarin-language films. I decided to watch the first 15 minutes of Brotherhood of Blades. An hour and 15 minutes later, the sun was already rising and I realized how badly I needed to sleep. (The next day, I had to drive four hours on the left side of the road for the first time.) Fortunately, the movie was rather lousy and I was able to pull myself away from it—which is ne’er an easy task for me. After that, I had a Mandarin-less week, except for one morning that I had a terrible headache, missed the safari drive, and instead watched Dragon for the umpteenth time. We will be in Cape Town now for another week, during which I will be working rather intensively, but hopefully I can squeeze a little Chinese in on the evenings. Regardless, I’m very excited for the flights back to Brazil next weekend. I have two 10-hour flights on Emirates. I expect I can watch four to five new Chinese movies during these flights and clock in some 8 hours of Mandarin viewing—a true marathon and definitely a new record!